In the Southern states of the U.S., there is a popular (and tasty) dish that makes use of some ingredients that may have fallen out of favor in other parts of the country. Like most recipes from the south, everyone's got a different way to prepare dirty rice, including a few recipes that don't even call for chicken livers and gizzards. Here's a simply, yet full-flavored, version of dirty rice that even those in the South will approve of. 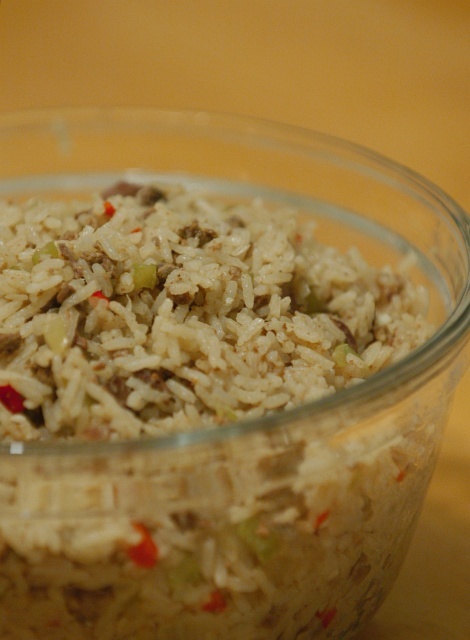 Dirty rice is named "dirty" because of the inclusion of chicken livers which gives the rice a fine-grained brown coating - making it look like it's dirty. In my book, if the dirty rice doesn't have livers and gizzards, then it isn't dirty rice. Be sure to purchase your livers and gizzards the same day you prepare this dish for the best flavor. Livers and gizzards tend to go bad much faster than the rest of the chicken, so it's best to get them as fresh as possible. A quick survey of my local supermarkets revealed that about half of them carried livers fresh in plastic containers in the refrigerated meats section, but none carried fresh gizzards. All the supermarkets sold gizzards and hearts together in a plastic wrapped tray in the frozen meats area. These work just fine for this recipe. 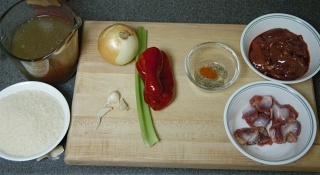 Start by laying out your ingredients (clockwise from top left): 4 cups chicken stock, one medium onion, one celery rib, one red bell pepper, 1/2 teaspoon ground black pepper, 1/4 teaspoon ground cayenne pepper, 1/2 pound chicken livers (about 5 livers), 1/4 pound chicken gizzards (about 6 gizzards), 3 cloves garlic, and 2 cups rice. Finely chop of the onion, celery, and bell pepper. Mince the garlic. 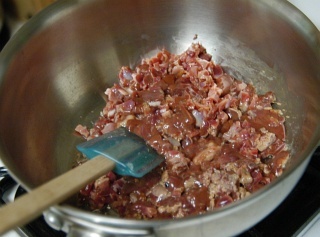 Chop up the livers and gizzards into small pieces (to about 1/4-in. or 5-mm cubes). Heat a medium saucepan with a tablespoon of vegetable oil, butter, or bacon drippings until the fat just shimmers. Brown the gizzards over medium heat for about 5 minutes, turning occasionally to evenly brown. 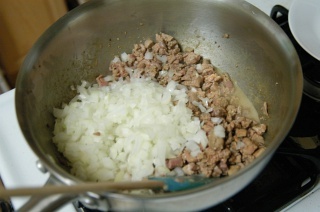 Add the chopped liver (the ingredient, not your sous chef), to the mixture and cook until the liver is just browned. Some moisture will probably seep out of the livers as they cook, so they won't brown up as nice as the gizzards, but that's okay. As soon as the livers aren't red or pink anymore, move to the next step. Add the onions to the liver and gizzards. Cook, while stirring, for another couple minutes until the onion just starts to turn translucent and tender. 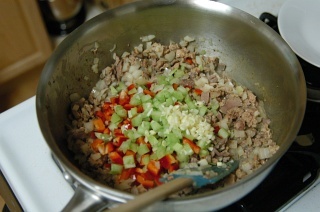 Mix in the bell peppers and garlic and cook for another three minutes while stirring occasionally. 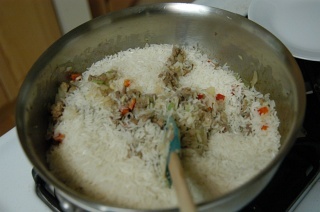 Pour the rice into the pan and stir to mix. 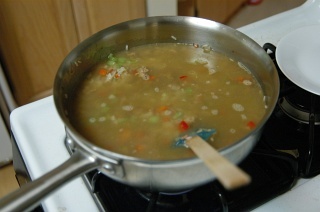 Once the mixture is boiling, cover and reduce the heat to low - just enough to keep the mixture simmering. I check this by listening for the steady sound of small bubbles popping (or use a glass lid). Allow the rice to simmer for twenty minutes, then remove from the heat. Fluff the rice and cover again for ten more minutes. Serve. 1 tablespoon (15 mL) vegetable oil heat brown cook until not pink cook until tender cook 3 min. mix add season to taste bring to boil simmer 20 min. fluff and rest 10 min. This is similar to my dirty rice recipe. I don't care for organ meats and find that almost any other meat makes a tasty dish - chopped steak, hamburger, chicken thighs, even vegetarian meat substitutes are good. I also do not find liver to be edible, good idea to use meat in its place, perhaps I'll try that sometime. :) This is a great recipe! Just like my mom used to fix for me. I would jazz up the spices a bit, using red, white and black pepper but not too much pepper in total. Also I would add sage. It should be spicey but not hot. There is a kind of sausage here in Lousiana called boudin which has rice and pork (including the pork liver) in a casing. It is similar to dirty rice. Also jambalaya is another form of "dirty rice" but with ham and sausage. Sorry, but what does "fluff" mean? I love chiken liver. 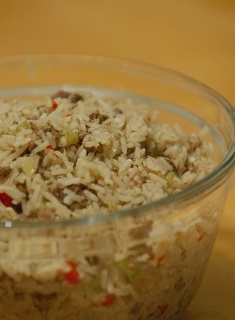 Use a fork to pry up the rice and kind of flip the pieces over and around to loosen up the grains of rice after cooking. When coking rice, the rice just sits there and as it expands and takes on moisture, the individual rice grains cram together. By fluffing it, we loosen the grains and introduce some hot air into the rice so it doesn't become one large clump. Once, in an emergency, I used fried chicken gizzards from a local fried chicken chain. I didn't even scrape off the breading. I cut back on the seasonings in the resulting dish a bit, but the resulting dirty rice was pretty good. Decided to make this the other day, made a few changes though, instead of the liver I used hot pork sausage, but let the gizzards in and changed out the salt for cajan seasoning and added some ground habanero. Turned out very well, and have lots of left overs. I assume the rice is uncooked when you add it. i'm horrible when it comes to cooking rice on the stovetop. can i use the rice cooker instead? rice cooker won't work since the rice cooks with everything else. you could try to cook everything but the rice and then add it all with the rice to the rice cooker, but then again it could stain the rice cookers bowl, and the inside cover, and well i'm not daring enough to try it. If you were wanting to try that I would go buy a new cheap rice cooker first. I cook in my rice cooker with ingredients and broths all the time. Always add raw meet and vegetables. It's my favorite tool in my kitchen. This recipe sounds great. I'll be trying it out this week to make sure I have the details worked out before our Cajun Thanksgiving. This is an awsome recipe, I cut back on livers and gizzards a bit and added 8 oz whole hog sausage, yum. I haven't used this recipe, but it's close to mine. I'll use ground pork in addition to liver and gizzards. I can't recall if this recipe calls for cumin, but you should try that. Just a teaspoon or it will taste like chili! I puree the liver in a food processor, so there aren't chunks of it in the dish. I also use instant rice. When the vegetables are soft, stir in the liver, as it cooks quickly, and you don't want to overcook. 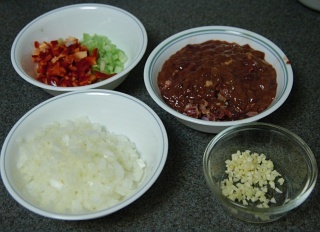 Once liver is cooked, pour in the rice, stir, and cover till rice is done. I have been looking for a dirty rice recipe and this really sounds great. I will make it this weekend. Your great directions and pictures will be very easy to follow. The problem is that the google ads next to you recipe included a listing for "enema recipes." What an awful thing to put with food recipes. Can I use uncooked Success boil-in-bag rice? Sounds disgusting, but looks interesting. I'll have to try a similar recipe with regular meat instead. PS: Molly, I think that the Google ads are put up automatically, and no one controls it. I'm from Louisiana and as a child my aunt had a friend who was pure cajun. I remember she made dirty rice for my aunt and it was one of the best dishes i've ever had, but as a kid i did not get the recipe. I am 65 years old and have tried to fine her recipe. Made yours and it was exactly like hers. thank you so much.Reminded me of when i was young. I like dirty rice (with organs) especially spicy and with Jerk chicken. Wonderful! Nice recipe - not dissimilar from my own. I can't really stress enough to readers though, that if it doesn't contain chicken liver, it isn't actually dirty rice...it's more like a basic Jambalaya. That said, even persons who state they do not like liver, like dirty rice. It does NOT "taste like liver." The flavors meld and become something wondrous and altogether different than the individual ingredients would lead a person to believe. It is even better the following day, reheated. Try adding some good andouille sausage (coarse ground pork, redolent with garlic and cracked pepper, then smoked) for a real treat. Yes, I would also like to stress that the liver and gizzard flavor is so married into the rest of the flavors in the dish that if you didn't know they were in there you wouldn't know they were in there. I DESPISE all types of animal liver, heart, variety meats, etc., but I know from two years as asst. kit. mgr. at a popular local cajun restaurant that authentic dirty rice is absolutely divine! I rapidly got to the point where I was living on red beans and rice, and could easily go back to it at any time! Just try the recipe, you'll be convinced. Liver is excellent! i'm glad to see more uses for liver. I'm from Philippines and we, filipinoes, love liver and gizzards. The moment i've seen your Dirty Rice recipe, I can't wait to try it! I'm not a professional cook and i didn't had a proper knowledge in terms of cooking so please bear with my version of your Dirty Rice. I've created a blog after I've created your Dirty Rice and posted it there. Kindly visit it at http://kusinerongpinoy-barney.blogspot.com/ and good job on maintaining this wonderful site! great recipe, i doubled everything and added a pound of ground pork. i have made a few variations to this dish one is with stewing beef and/or ground beef. I also added green&white onions finely chopped. This variation tastes great. Also you can sub the beef for veggie burgers that you cut up into smaller peaces for those who are vegetarians. Also you can use tofu. I used extra firm fried but add it to the mix after the rice is cooked otherwise the tofu will fall apart. Both variations turned our really good. Also i caramelized the white onion and garlic together. Preheat oven to 350 F. Cut off top quarter inch of garlic head. Drizzle oil over head. Wrap head in tin foil. Bake until golden, about one hour. Onions: Chop the onion into crescent shape and slow cook with oil and/or butter tell the onions are translucent and lightly brown. I cook the rice with chicken stock in my rice cooker, and then toss everything in the wok at the end.